At the Burnt Hills Veterinary Hospital, we have several highly skilled doctors who perform orthopedic surgery on a regular basis. The art and science of physically changing the anatomy to treat diseases, injuries, and deformities takes on many forms. At the Burnt Hills Veterinary Hospital, our veterinarians maintain the highest quality of patient care, aseptic technique, surgical instrumentation and techniques based on current peer reviewed research. Licensed veterinary technicians assist in maintaining high quality anesthesia, fluid therapy, pain management and pre and post op assessments. These are a few of the vital components monitored to ensure the best possible outcome. 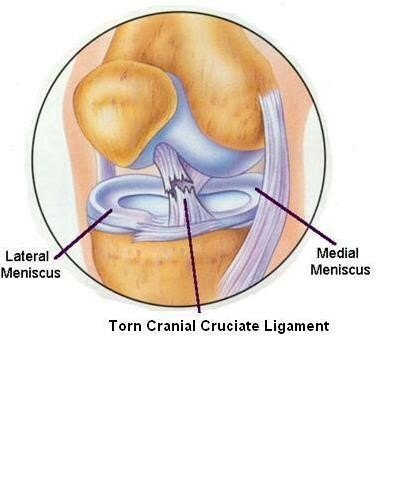 Cranial Cruciate Ligament Rupture (CCL) is the most common orthopedic surgery performed. The dog’s stifle (similar to our knee) is stabilized by many ligaments. The two bands of fibrous tissue that comprise the cruciate ligaments join the femur and tibia (bones above and below the knee) to allow the knee to work like a hinged joint. The cruciate ligaments prevent abnormal forward and backward motion of the bones in the knee. Most often, symptoms of a ruptured or torn cruciate ligament develop when your pet is playing ball, running, or jumping and suddenly changes direction. This places an extreme amount of force on the cruciate ligament, and causes it to completely rupture. The stifle is now unstable, and moves, which causes significant pain and inflammation within the joint. This pain causes the slight, intermittent, or obvious lameness you may have noticed. Cruciate ligament disease in dogs is rarely an acute or sudden injury. It is now known that the ligaments in the knee, primarily the cranial one, weaken over time from chronic use and stress, and may be stretched or partially torn before rupturing completely. After CCL Rupture has been diagnosed by manual manipulation and possibly radiographs, surgical repair is needed. Rapid surgical intervention and proper rehabilitation can greatly slow the onset of arthritis, degeneration of the joint, and allow your pet to regain nearly normal function of the limb. Repair should be done as soon as possible following the diagnosis. There are other concerns from waiting between injury and repair, including damaging the cartilage in the knee (or meniscus), as well as muscle wasting or loss. For every day that there is muscle loss (starting from time of injury) it takes 3 days to regain it. The most serious secondary problem is damage to the other knee, due to the increased weight put on it. Studies have shown that 40-50% of dogs will rupture the cranial cruciate ligament in the other knee within 1-2 years of the first surgery. Your pet will have the injured leg shaved down to the skin to provide a cleaner surface for the doctor to do surgery. A technician will carefully surgically scrub the leg to remove surface dirt, bacteria, and any other debris that would contaminate the surgical field. A betadine drape is used to provide a sterile operating surface. Careful sterile technique is always used with our surgeries. The surgeon will wear a sterile gown and gloves, and both technician and surgeon wear a cap and mask to reduce contamination in the surgical suite. There are several surgical techniques available to repair a ruptured cranial cruciate ligament. The appropriate surgical technique will be decided upon at the time of your visit with us. 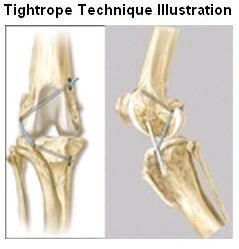 Our veterinarians prefer to use the Tightrope CCL technique, a veterinary specific extracapsular repair, which provides immediate stability to the joint and has very few complications while being minimally invasive. The Tightrope CCL technique utilizes a very strong suture material called FiberTape and isometric placement of small bone tunnels to provide bone-to-bone fixation while not causing the trauma of cutting through the bone of the tibia like a TPLO - Tibial Plateau Leveling Osteotomy or TTA - Tibial Tuberosity Advancement procedure. The objective of TightRope CCL is to stabilize the joint while providing optimal range of motion. At time of surgery, the stifle joint will be explored and checked for any pieces of torn ligament that need to be removed. 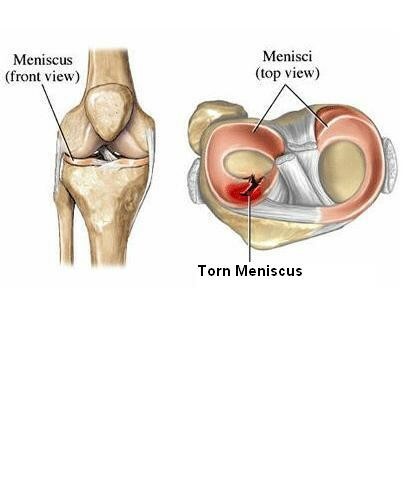 The menisci in the knee will also be examined, and removed if they are damaged. The advanced technique that our surgeons use involves the placement of a specially designed synthetic implant. This FiberTape is placed through the femur, crossing the joint and into the tibia. A tightening device is used to ensure proper tension is achieved. The FiberTape material is extremely strong and does not stretch. The placement of the synthetic ligament takes over the function of the torn CCL, preventing the forward drawer motion (instability) of the knee, allowing your pet to regain pain-free function of the limb. The incision is carefully closed, and suture may be placed on the outer most layer of skin, which will need to be removed in the clinic in 10-14 days. Post-operatively, your pet will be moved to a recovery area where the entire staff of doctors and technicians will keep a close watch throughout the day. Injectable antibiotics will be administered to help prevent infection within the joint or incision region, and further pain medication may be given to allow your pet to stay comfortable. Ice is immediately placed on the stifle after surgery, to decrease the amount of swelling and pain in that area. A warm, comfortable run or cage will be where your pet stays for the night, allowing it to recover from surgery in a quiet environment. The post-operative period is as important as the surgery itself. Proper care and early physical rehabilitation will speed up weight bearing, reduce muscle atrophy, and promote early return to function. The proper type of rehabilitation may also help prevent or slow the occurrence of a rupture in the opposite limb. As your pet regains use of the leg that had surgery at a quicker rate, it places less force on the opposite limb for a shorter amount of time. Physical Therapy will begin immediately upon completion of surgery. Laser therapy is an adjunctive treatment used to immediately start helping with pain, inflammation and healing. While your pet is recovering from anesthesia the first laser therapy treatment is provided post-operatively. After the laser treatment is completed, the incision will be iced for 15 minutes to reduce post-operative swelling and inflammation. The First and Second day post-surgery are very important days in the rehabilitation process. During this time your pet will be hospitalized to obtain extensive physical therapy. Our physical therapy certified doctors and technicians will create a plan that is designed to your pet’s specific needs. Complete cage confinement and bandaging to restrict all motion are no longer the standards of care! Early weight bearing, and gentle, very short, controlled leash walks will be part of the rehabilitation plan. First thing in the morning your pet will receive anti-inflammatories and pain medications to aid in their recovery process. The surgically repaired leg will also be massaged and receive laser therapy at this time. Massaging helps to reduce swelling, pain and encourages muscle relaxation. This can be done on the affected leg, as well as the opposite leg. Massage therapy will occur four times a day. Laser therapy will continue once daily to help accelerate healing and decrease pain. After the medications have had time to work, a special rehabilitation machine called an electrical stimulation unit will be used to provide pain relief and help reduce swelling. This unit provides a “pins and needles” sensation to the leg, reducing both pain and swelling of the leg. Twice a day, your pet will undergo physical therapy exercises designed to aid in stimulating the use of their leg as well as start the process of regaining muscle strength. These exercises range from simple placement exercises, to range of motion exercises, to using balancing apparatuses to stimulate the use of the surgically repaired leg. Early movement of the knee is very important to aid in healing and to prevent scar tissue from inhibiting range of motion. When physical therapy exercises are completed, your dog’s knee will be iced for 15-20 minutes. Icing will be applied four times throughout the day. The third day post-surgery is typically the day of departure from the hospital. We will continue physical therapy until the time of discharge. As you arrive for the discharge of your pet, the doctor or their technician will sit down with you and go over your home care instructions and what you can anticipate as your pet recovers. This will be a great time to ask any questions or bring up concerns you may have. Additionally, you will be sent home with clear written instructions for you to follow and all required medications dispensed by the doctor will be discussed. If you find that you have additional questions, do not hesitate to give us a call. Your dog has undergone extensive orthopedic surgery on their knee. Physical rehabilitation and postoperative care at home is now in your hands. With our instructions, we will develop a complete physical rehabilitation program for you to follow at home that covers dietary adjustments, pain management, and passive range of motion (PROM) and other exercises. As progress continues, new exercises will be implemented and adjusted for your pet’s specific needs. It is important to remember that every dog is different and some may not tolerate some of the suggested therapies. The exercises should always be performed slowly and should not cause pain. Be persistent, however, as some dogs will resist the new activities and exercises though they are not causing any pain. Please call at any time during the rehabilitation period if you have any concerns. Walks & Activity: Exercise restriction is going to be needed. Your dog should not be outside off of a leash for at least 6 weeks after surgery. If your dog is unable to bear weight on the leg, it is important to use a towel sling, around the abdomen holding it from above, to help prevent slips or falls, and prevent excessive pressure on the opposite limb during walks. Be sure to always walk slowly to help encourage weight bearing. Increased speed allows them to hop on 3 legs easier. Running and jumping must be prohibited for the first 8 weeks. This includes getting in and out of a vehicle, on or off of furniture, or playing in the house or with other animals. When you have to leave your dog unattended, the area they stay in should be restricted to avoid over-activity or injury. A large crate or smaller room can be an effective area, depending on the size and activity level of your dog. They should be able to get up and move or walk around comfortably. Complete confinement is not recommended. One of the biggest factors of how well a patient does post-operatively and long term is managing a very lean body weight. An appropriate weight loss program is almost always implemented for our orthopedic patients. It is important to remember that the healthy, lean dog is also going to gain weight during the recovery period because activity will be greatly restricted and reduced, so diet adjustments are necessary. We have several tools available to help you with your pet’s weight loss efforts, including developing a personalized weight loss plan, physical rehabilitation and exercise programs, regular weight checks and follow-up care long after your pet has reached their ideal weight. A glucosamine/chondroitin/MSM supplement should also be started, and your pet should be kept on this for life. Our doctors recommend and will provide you with a free sample of Dasuquin. Dasuquin chews or tablets are made with high quality ingredients and are a trusted source for these nutraceuticals. Dasaquin helps keep the tissue and fluid in the joint healthy and elastic, repair damage to the joint easier, and also helps reduce some of the inflammation present within the joint. These changes occur, even with surgical repair, as osteoarthritis development will continue as your pet ages. Every 2 weeks for the first 2 months post-surgery, your dog will have a follow up recheck with your surgeon. Sutures that were placed need to be removed in 10-14 days after the surgery. At this visit, a doctor will evaluate weight bearing, limb use, and condition of the surgical site. If you have any questions regarding activity, rehabilitation exercises, or care, they can be answered for you at this time. A recheck appointment with the doctor is scheduled for 4 and 6 weeks after surgery. At this time, as physical rehabilitation progresses, new exercises will be implemented and activity increased to help strengthen the joint and muscles of the leg, and also to retrain proper balance and coordination. Many dogs are fully functional and exercising regularly by 6 months post-operatively. During the rehabilitation period, some pain and discomfort may happen if too much activity occurs. Properly managing the level of exercise, following the guidelines that were set for you by your veterinarian is important. It is crucial that your pet is never allowed to perform sporadic, quick jolting exercises, such as chasing a tennis ball, or jumping out of a truck or from other high places. Each individual pet will recover at a different rate but it is important to continue physical rehabilitation, and gradually introduce your pet back to their regular activity.